← McLaren Vale Wineries – Vintage Over, Now What? A couple of years ago I heard some people talking about a project – called the Rare Earth Project. I did not know what it was about, but it had a few people excited about using this project to promote what is special about McLaren Vale. Since then I had heard about the project and over time realised it was about promoting things that are special about McLaren Vale – Shiraz and the varied geological earth that makes up the Vale. I soon found out that there was going to be promotion about various McLaren Vale Shiraz wines that showed regionality and an essence of the Vale. I eventually found out the project had a new name – Scarce Earth. The first wines for the project were to be from 2009 and they had to undergo 3 special tastings. Wineries could submit barrel samples from single block wines (not single vineyard but single block). If the wines were judged to be worthy then second tasting was required and then a third from the final wines. The tastings were undertaken by local masters of their wine making profession. Only the best essence of the region was allowed to progress from one tasting to the next. 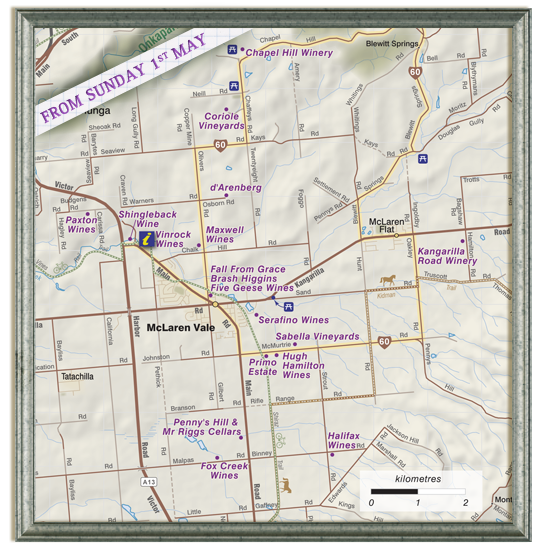 In what seemed to be a short time the wines were made available at various wineries and tasting places around McLaren Vale – as shown by the below map. The map has been put together by McLaren Vale Grape, Wine and Tourism Association. From May 1st until either the wines are sold out or the end of July comes around, these wines are available for tasting. The 2009 Vintage has special significance to me as that was the year I worked at Fox Creek Wines – as the Laboratory Assistant. So this also sparked my interest. So, I have set myself a task to taste these wines and bring the tasting notes to you, the readers of Lonely Grape. I am going to write about one wine this time and I could not go past the Scarce Earth offering from Fox Creek. The remainder of the wines I will report on in the coming weeks. I feel like I have done some growing up with this wine. I saw the grapes for this wine arrive at the winery and I took samples from the open fermenters through to transferring to barrel and checking the Malolactic Fermentation progress of the wine. I also was party to a barrel tasting that included this wine about a month ago. The grapes come from vines planted in 1910 and the wine has always shown something special. There is intensity and complexity at every turn. Please ensure you decant this wine to see it at it’s best. I swirled this wine for about 20 minutes before it started to open up with dark cherries, red raspberries, plums with hints of cinnamon and cardamon spice with a final wisp of musk. The intensity just kept building with layers of plum and dark cherry the same lovely spice . The oak treatments are spot on with the oak not overpowering but the cedary tannins add much to the wine. Of course the wine would last for many years in a cellar but it is already drinking well now – I suspect most of the very small production (about 50 cases) will be consumed while young. Drink this wine with wonderfully complex and slow food – maybe Osso Bucco. This entry was posted in Mclaren Vale, wine and tagged Australia, cellar door, Mclaren Vale, McLaren Vale Wine, Shiraz, Small Producer, wine, wine McLaren Vale, Wine tasting descriptors, Winery. Bookmark the permalink. Sampled it today – beautiful !!! Glad to hear you not only tried it but also shared that with us. Let us know if you get to try others from the Scarce Earth Shiraz Project.